Samantha Whipple, the last living descendent of the Bronte family, arrives at Oxford where she plans to study English Literature like her father before her. Sam's father, a brilliant but eccentric man, died in a few year's earlier. Before he passed away he told Sam that she would someday inherit part of the Bronte legacy, however, nothing ever surfaced prior to her heading off to Oxford. Once Sam arrives at school she's told that there is a shortage of housing and is escorted to what will be her dorm room. Her room is located in a cold, windowless tower which is reported to have a mysterious history of its own. Built in 1361, the room had at one time been used to quarantine victims of the plague. Sam hates her room but, doesn't make waves by demanding a transfer. Before long clues, along with bits and pieces of her father's legacy begin to appear outside her room and inside the dorm, including her father's annotated Bronte books which should have perished in the fire that took his life. Sam college days spin into a literary scavenger hunt of sorts helping her to learn more about her father and the man he really was. This is a story that blends mystery, literature, history and even romance into a page-turning debut. 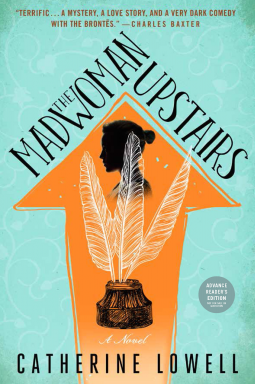 The novel felt like a modern retelling of Jane Eyre and the lives of Emily, Charlotte and Anne Bronte. There was a lot of commentary about the sisters and, I wasn't sure what was fictionalized or accurate. The story is written with a lot of wit and humor infused which I loved, even though I wasn't a fan of Sam herself. Sam came across as someone who disliked literature yet that's what she went to Oxford to study. She also wasn't very assertive and came across as a bit of a ditz at times as well. I did like that there were many references to well known literary works throughout. I think that this is a book that will appeal to literary and mystery lovers alike, even if they are not huge Bronte fans. I don't know much about the Brontes. Would I still "get" this book? Neither did I Kathy, but, it was still fun. Great hope you have fun with it! Seriously, I am interested in the story and think the idea of different things 'appearing' and a sort of treasure hunt sounds fun. Plus I'm a fan of Jane Eyre, even if I haven't read it since my teens. It was very fun and the tower room added a great element to the story. I've just kindled this one and can't wait to read it! Sounds like my cup of tea :) So glad you posted it about - makes me more excited to read it now. Oh great Nadia - I do hope you enjoy it. I like the sound of this one! Adding to my list...again. Great, it was different and I do like trying new debut authors as well. A ditz? I cannot handle ditzy so I will pass on this one. I love the title though. Hmmm, she's a fun ditz though! Ok, I think I should give this one a try. I know a little about the Brontes that might get me through! I do wish I knew more about the sisters!